The shabby chic trend is all the rage. Its combination of vintage chic with modern utilitarianism is up-to-the-minute and easy to achieve. So have some fun with some cheap or old cutlery, some aluminium and create a fashionable talking point for your kitchen. This is a fun project for anyone in your household who likes spending time working with their hands. 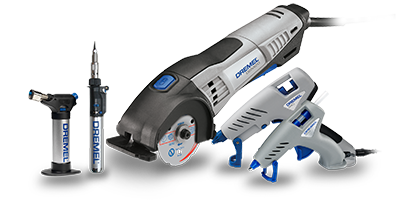 It’s not complicated to create using your Dremel® VersaFlame and Dremel® 8200. Simply follow our step-by-step guide and use our pictures to guide you! Buy three x 1 metre strips of aluminium flat bar 2 mm thick by 25 mm wide to make the three rings of the chandelier. For the large ring, use the whole metre. For the medium ring, use a length of 75 cms and the small ring, use a length of 55 cms. Bend each length into an individual circle. Then, screw four metal brackets into your workbench to hold the size of hoop you want to weld. Weld together the two ends of the hoop using the Dremel® Versaflame. In order to do this, firstly clean up the faces using your Dremel® 8200 with a Dremel® stainless steel wire brush 530 to remove oxidisation, dust etc. Then heat the aluminium edge of the two ends of the hoop to melting point – 380 degrees - using your Dremel® Versaflame. Lay a bead of the aluminium rod onto each face of the ring, then abrade to break through the oxidation so that the bead of filler rod merges with the aluminium. Close up the ring, then heat up until it reaches its melting point again and the two mating faces will fuse together. If necessary, add more filler rod. There are some good tutorials on YouTube to help you do this. Measure the external circumference of all the hoops and note down their sizes. Then, working on the large hoop, divide the hoop into equal segments, one segment per piece of cutlery you are going to hang on each hoop. And mark up. We used 24 pieces of cutlery on the top hoop, 12 on the middle and 12 on the bottom hoops. Divide the hoop circumference into quarters and mark at the quarter point, the place where you are going to attach your chain. These four chains will suspend each hoop, one from the other. Drill a hole at each quarter point with the Dremel® 8200 and the Precision Drill Bit Set 628, 3.2 mm drill bit. Use a centre-punch to avoid your drill skating across the surface of the aluminium. The middle hoop will need two drilled holes at the top and bottom of the hoop to attach the chains. TIP: It is advisable to use a cutting fluid when drilling into metal. Firstly make the centre aluminium disc for the crown which will take the support rods from the large hoop. Cut a 60 mm disc out of a sheet of 2 mm thick aluminium using your Dremel® 8200, Dremel® Tungsten Carbide Cutter square tip 3,2 mm 9901 and the Line and Circle Cutter attachment 678. Then cut a circular hole in the centre of the disc to create a 27 mm circular hole with the 9901 to take the light fitting. Smooth the edges of the hole using the Aluminium Oxide Grinding Stone 952. Returning to the hoops, at the quarter points, weld a 4 mm thick aluminium rod 230 mm long to the inside of the hoop, above the hole you have drilled. When all four are fixed in place, bend the rods and weld to the centre disc, overlapping it by 10 mm in each case. Once you have your structure, weld on two aluminium rods per quarter equally spaced which you will have bent by hand into shapes which mimic tangled stalks, and onto which you can attach metal leaves. To make the leaves, mark up and cut out metal diamond-shaped leaf shapes from very thin sheet aluminium 1 mm thick using your Dremel® 8200, SpeedClic Mandrel SC402 and a SpeedClic Metal Cutting Wheel SC456, then weld them onto the aluminium rod stalks using your Dremel® Versaflame. Cut a groove with the Dremel® 8200 fitted with the SpeedClic Metal Cutting Wheel SC456 on the top of each hoop at each of the marked up segments. Use the holes drilled earlier in the link rings. Add the spiral link rings. Then, attach the chains to link all the hoops together. Next buy a chandelier ceiling rose and chain. Unscrew the ring from the lamp holder, insert the lamp holder into the disc at the top of your chandelier tightening up the retaining ring. Hang from the ceiling wiring up to an existing light fitting making sure you have turned off the electricity first – or get your electrician to do this for you. Drill holes in the handles of your cutlery using the Dremel® 8200 and a drill bit from the Precision Drill Bit set. Then, take a paper clip and open out so that you have a S shape, then hook the large S over the frame of the hoop in the groove and the bottom S into the drilled cutlery. Use a standard 60 watt candle bulb to illuminate. TIP: We hung the largest hoop at the top with large spoons, interspersed with large forks in between facing outwards, the middle sized hoop with forks and the smallest hoop at the bottom of the chandelier with small teaspoons all facing outwards. If you are buying cutlery, make sure that it is low quality catering cutlery, easy to find online, as it is important that it is thin, soft and easy to drill through.